Appleby-in-Westmorland parking with 230 spaces. Paid Parking marked in red, has capacity for 62 cars in the town's centre. Up to 1 hour's parking costs £1.40. Up to 10 hours costs £3.30. Sundays and Bank Holidays are £1. Between 8pm and 6am parking is free. There are additional paid places at Appleby Station. Disabled parking for 4 cars, marked in green, can be found at the bottom of Boroughgate outside the Post Office. Buses, space for 4 marked in blue. 2 at the bottom of Boroughgate beside Moot Hall and 2 more on The Sands near the bridge. 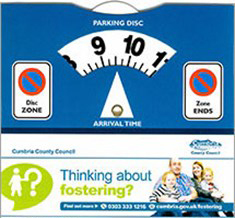 Free parking marked in yellow provides space for about 160 cars Monday to Saturday 8am-6pm with a display disc that you can get for free from any of the Appleby shops or the Tourist Information Center. In the area around the Tourist Information Center parking is for 2 hours with no return within 2 hours. Further out from this area parking is for 3 hours with no return within 2 hours.